Vicky previously blogged about Securing the future of Scottish Wildcats, here she updates us on SWA’s monitoring and protection work. Scottish wildcats are our only remaining native cat species, and they perform an important function in a healthy ecosystem. They are also part of our cultural heritage in Scotland, with some clan crests featuring the species. Wildcats in Scotland are near the brink of extinction, with a recent estimate based on a range-wide trail-camera survey putting the figure at around 100-300 left in the wild. After extensive survey work using 347 trail cameras, Scottish Wildcat Action found at least 19 wildcats in the Scottish Highlands based on coat markings (also known as pelage scoring). With the help of 150 fantastic volunteers, the huge task of sorting approximately 200,000 images from the trail cameras used last winter/spring is now complete and the data is being analysed using capture-mark-recapture models. Somewhat less intensive survey work will continue but this vast bank of data is helping staff on the ground to target their conservation efforts. As well as wildcats, the trail cameras also showed where feral cats and hybrids are living wild. An extensive Trap Neuter Vaccinate and Return programme is currently underway, in a huge effort to prevent feral and obvious hybrid cats from breeding with wildcats and passing on their diseases. Scottish wildcats are very elusive and are rarely seen. Tracks, signs and dens are a poor identification method, so their presence can go unnoticed. They are primarily an ‘edge’ species; dependent on the presence of cover. This can be woodland, scrub or even piles of boulders. They often hunt in open habitats, like grassland, but are also attracted to recent clear-felled forest blocks as they become colonised by grassland prey such as voles. Their preferred prey is rabbit, which they generally turn inside out (one of the few reliable signs of their presence). They can also predate on small rodents and birds and with the current low rabbit numbers in northern Scotland, most wildcats will be subsisting off voles (as they would have prior to the introduction of rabbits to this island). 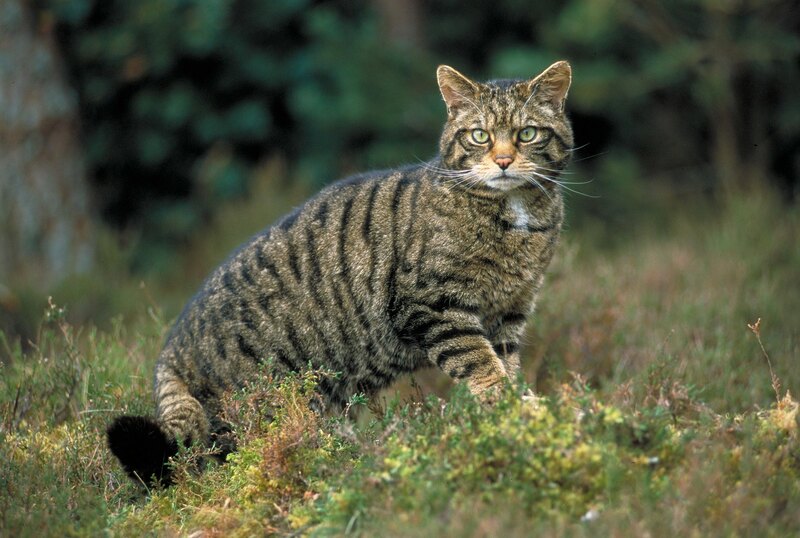 Scottish wildcats have hung on in pockets across Scotland to the north of the Highland Boundary Fault. Pre-project surveys defined six wildcat priority areas where there is the greatest probability of being able to save the wildcat population that remains. The six wildcat priority areas are Strathspey, Angus Glens, Strathavon, Strathbogie, Strathpeffer and Morvern. The recent survey showed that even in these priority areas, wildcats were outnumbered 5:1 by non-wildcat. But this is better than the Scottish wildcat range average of about 8:1. Now the focus is on taking action to save what’s left in the wild whilst building up a robust population in captivity that are suitable for later release through a conservation breeding programme led by the Royal Zoological Society of Scotland. This programme is inspired by the hugely successful Iberian Lynx project in Spain. Great progress has also been made in the genetics research carried out by the RZSS WildGenes laboratory at Edinburgh Zoo. 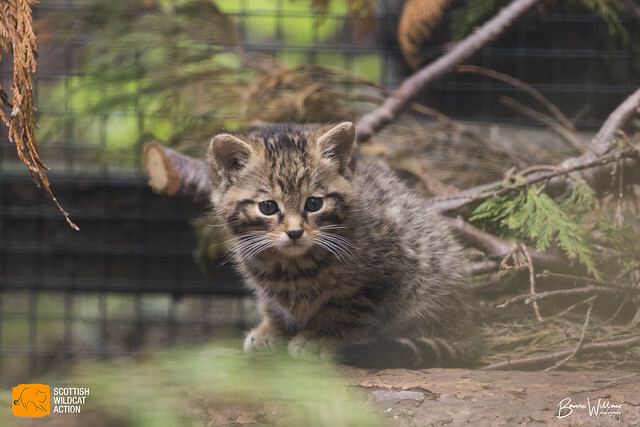 A genetic test to distinguish between wildcats and hybrids was created two years ago by Dr Helen Senn the WildGenes Programme Manager and now her team have successfully tested all the captive wildcats in zoos and wildlife parks across the UK. The good news is that there are some very high scoring cats in captivity as they have been protected from exposure to domestic cats unlike their wild relatives. The next step will be to identify ways to introduce new genetic material from the wild to improve the diversity of the captive population. Watch this space!